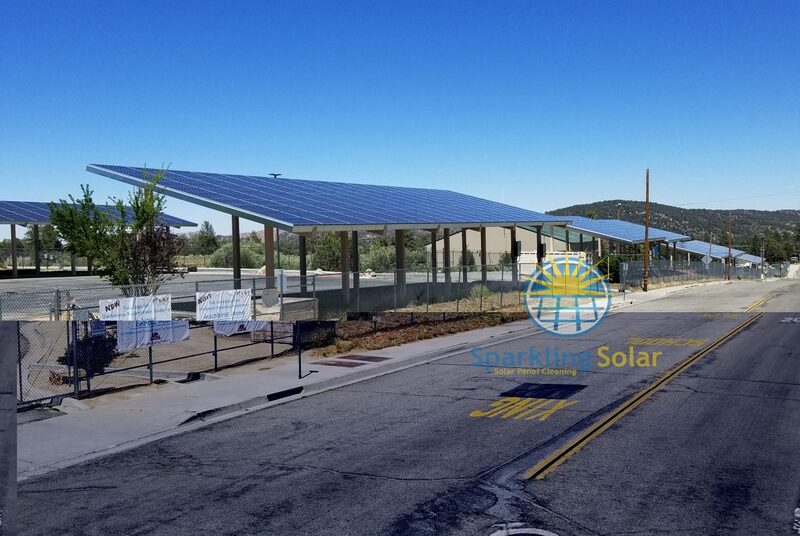 For half a decade, Sparkling Solar Cleaning has been helping residents and businesses with a variety of specialized cleaning and maintenance services. We provide Solar Panel Cleaning in Bakersfield and other major cities in Kern County. Sparkling Solar is an environmentally responsible company and we use only Eco friendly products. 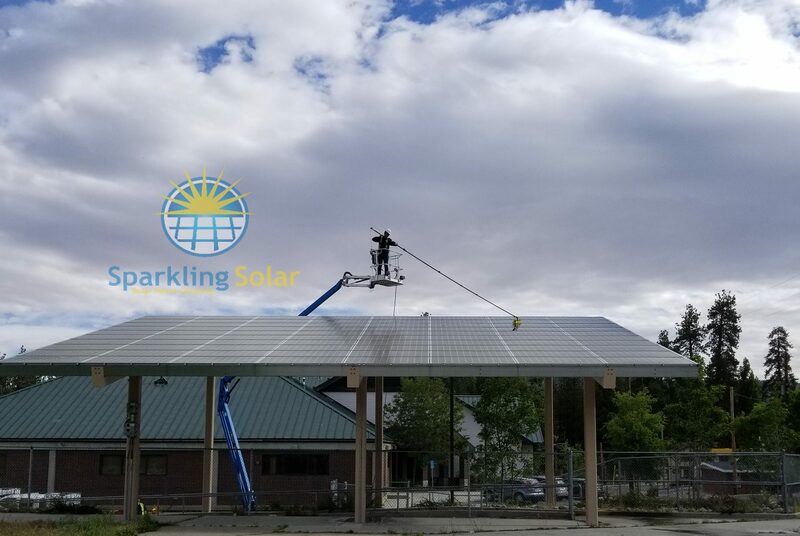 At Sparkling Solar we understand the severity of the California drought, that’s why we use a minimal amount of water necessary to effectively clean your solar panels, leaving them sparkling! Can I clean my solar panels with a hose? DON’T HOSE OFF YOUR SOLAR PANELS!! This is potentially the worst method home owners can use, it actually damages your solar panels. How? Here in the central valley we have very hard water, this means deposits of calcium, magnesium and minerals such as limestone, chalk and dolomite are in our water. When using this water to clean panels it leaves deposits on you panels and can deteriorate the gaskets, and deposits left behind are a big contributor to solar panel shading. The hard water deposits not only shade you panels, resulting in lost energy, but it attracts even more dust. At Sparkling Solar we use a method that is custom in the solar cleaning industry. Cleaning solar panels is important to us that’s why we use methods that are safe, clean, effective, and will not void your warranty. Purchasing solar panels is a significant investment and when solar panels become dirty due to dust particles, tree sap, bird droppings, and/or tree leaves it will greatly diminish your solar power output, meaning you aren’t getting the production you paid for. Today the most common way to clean solar panels is to use dish washing soap and/or commercial cleaning detergents. Unlike dish washing in your sink, however, the soap or detergent product sprayed on your panel will ultimately end up coming off of your roof into your yard, patio or deck areas as opposed to down the drain. Constant use of cleaning products may damage solar panels as well as foliage, plants, or trees and may also be harmful to animals and pets. Scheduling is easy! Call us today to schedule your solar panel cleaning or estimate for bird proofing your solar panels. Also, feel free to take a look around and learn more about why we’ve become the leading name in the solar panel cleaning service in Bakersfield. Thanks for visiting our site and feel free to call us with any questions or to schedule your next service: (661) 717-6424. Whether you are a business or home owner, having your solar panels cleaned and maintained on a regular basis is recommended for optimal performance. Here at Sparkling Solar Cleaning we offer affordable routine service so you don’t have to think about it. 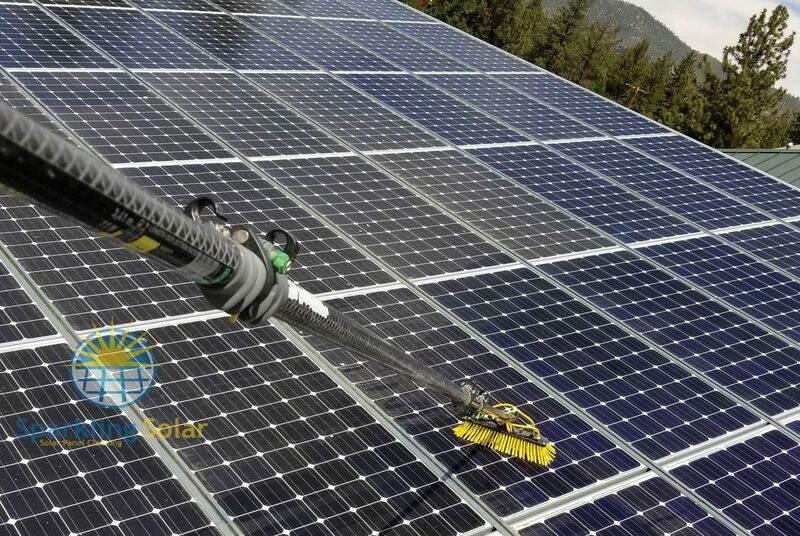 From excess dirt to bird droppings, grime and debris can cause major problems for your solar panels.You may not know that regular solar panel cleaning and maintenance is critical to functionality and performance of your solar panels. If you are leasing your solar panels you are required to maintain them or face high and unexpected fees. Households and businesses alike will have to deal with solar panel cleaning at some point in time – especially immediately following a heavy wind and dust storm. Failing to handle dirt and debris on your solar panels can cause damage and cost you more money in repairs and replacement of damaged solar panels.